Scooters are selling like hot cakes for one main reason: their inherent quality of offering a hassle-free commute. If you’re looking for point A to B commute and don’t want to bother with gear shifting, a scooter is the answer. Plus, they score big on practicality, thanks to an underseat storage and spacious floorboard space. Honda seems to have captured the market with its bestseller, the Activa, and here’s how it stacks up against its primary competitor, the TVS Jupiter. Both the Activa and the Jupiter look like typical family scooters. Their purposeful metal bodywork is devoid of flashy graphics, and look quite premium. The Activa features an LED headlamp, while the Jupiter makes do with a halogen unit. However, the Jupiter gets an LED tail light. The Activa gets an analogue digital instrument cluster with ‘Eco’ speed indicator. Similarly, the Jupiter also gets an ‘Eco’ and ‘Power’ indicator which tells you whether you’re riding aggressively or efficiently. Both the scooters feature an apron hook and a hook under the seat. The Activa has handle lock that secures the steering only when tilted towards the left, whereas the Jupiter has a double-sided lock. This should come in handy when parking at odd angles. At 18 litres, the underseat storage on the Activa is bigger than the Jupiter’s by a litre. However, the Jupiter features an external fuel filler for added convenience, while the Activa’s fuel cap is under the seat. Both get an underseat USB charging port as an option. The ZX variant of the Jupiter features a Duracool seat which TVS claims is 10 degree celsius cooler under sunlight when compared to a normal seat. The Activa and the Jupiter are more or less equal in terms of power output, but the former is more torquey. This helps in accelerating quicker off the line and for lugging heavier weights as well. In our tests however, the Activa clocked 0-60kmph in 10.55 seconds, while the Jupiter (Classic variant) took 9.16 seconds only. The claimed efficiency figure for the Activa stands at 60kmpl while TVS claims that the Jupiter will return 62kmpl. 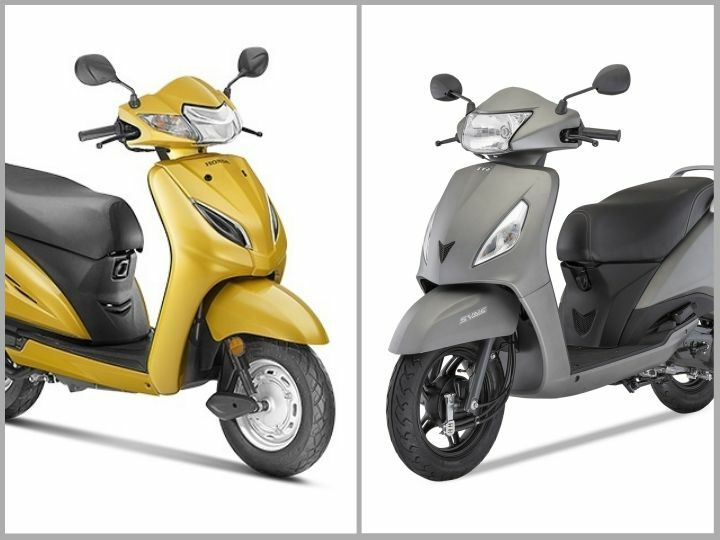 The Jupiter features better underpinnings than the Activa, and is noticeably more comfortable too. The telescopic forks in Jupiter soak up bumps much more efficiently than the bottom-link unit in the Activa. The Jupiter also gets a 220mm front disc as an option, apart from the standard Sync Brake System (SBS)-equipped drum brakes. The Activa makes do with only drum brakes with Combi Brake System (CBS). These two features work on the same principle of applying a part of the brake force on the front as soon as the rear brake lever is pulled. The large 12-inch wheels contribute to Jupiter’s pliant ride quality too. The Jupiter’s longer wheelbase results in better stability at higher speeds. The Activa pulls one back though with a slightly larger fuel tank. Honda sells the Activa 5G in Standard and DLX variant, priced at Rs 53,565 and Rs 55,430, respectively. The TVS Jupiter is available in the base (Rs 51,163), ZX (Rs 54,111), ZX Disc (Rs 56,163) and Classic Edition (Rs 57,323) (all prices, ex-showroom Delhi). The ZX Disc variant of the TVS Jupiter seems to be a better deal in comparison to the top-end Activa considering the overall dynamics and features that TVS offers. The Classic Edition is essentially a retro-style variant of the regular Jupiter, complete with windshield, chrome grab rails with cushioned backrest, premium seat and apron panels. Activa old is gold brand .performance of activa is best on highway plus it has metal body and front fiber so its better than high value activa 5G. Activa old is gold brand .performance of activa is best on highway plus it has metal body and front fiber so its better than high value activa 5G. i am using Jupiter for last 2 years 9- special edition , i am happy with its performance and usability . i am using Jupiter for last 2 years 9- special edition , i am happy with its performance and usability .